Speedy Adventure boat tours take place up to three times a day. Whale watching with a swimming stop, Los Organos in the north, or once around the Isla de La Gomera – excursions with the Speedy Adventure will take you to the island’s highlights. Choose from three different excursions. 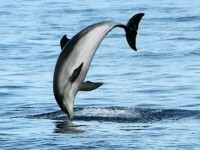 Would you like to see some whales and dolphins up close near La Gomera? The chances of spotting some of these fascinating mammals on a trip with the Speedy Adventure are good. The boat has a yellow flag when whale watching. Jose Miguel B. Mesa and his team sail under a yellow flag to signify sustainability for trips to see dolphins and whales. Of course, there is no guarantee that you’ll spot a whale; they thankfully live freely off the coast of La Gomera. 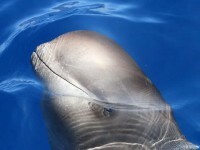 But pilot whales and other sea creatures are often spotted close to the coast. If you opt for the whale-watching tour, you’ll be able to enjoy a refreshing dip in the sea during a swimming stop. The boat anchors in an idyllic bay – an ideal place to snorkel. A swimming ladder makes getting back into the boat easy. This boat tour with the Speedy Adventure takes about two hours, including the swimming stop. Sail around the west coast and head towards the north of the island where the impressive basalt pillars of Los Organos await you. The full scale of these rock formations can only be seen from the water. The steep cliff face resembles natural organ pipes and is said to be one of the most stunning rock formations in the Canary Islands. After the boat leaves the harbour in Vueltas, Speedy Adventure sails to the rocky north-west coast, getting within 200 metres of Los Oranos, which are near Vallehermoso. The bright yellow boat gets there very quickly, giving guests plenty of time to enjoy the view. On the way there, passengers can enjoy a view of the Valle Gran Rey, Taguluche, the coast of Alojera, Tazo, and Arguamul. This excursion on the Speedy Adventure lasts about two hours. 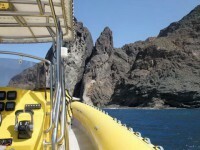 The Speedy Adventure sails along the coast all the way around the Isla de la Gomera. You’ll pass by deserted beaches, the Los Organos rock formations, and idyllic bays. If you’re lucky, you’ll be able to see Spain’s highest mountain, Teide on Teneriffe. 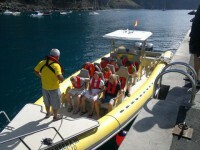 The boat tour gives you a unique perspective on the island’s towns, such as Vallehermoso, Agulo, Hermigua, San Sebastian de la Gomera and Playa Santiago. You’ll also be able to spot more remote areas of the island, like Ermita de Puntallana in the east, which houses the island’s patron saint. 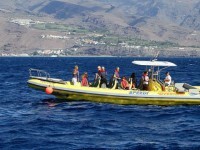 This tour on Speedy Adventure takes approximately three and a half hours to sail on the Atlantic around La Gomera. The harbour in Vueltas in the Valle Gran Rey is the starting point for all of the excursions. The different departure times are ideal if you want to be flexible with your holiday planning. The excursions in the late afternoon will give you a good chance to experience a beautiful sunset out on the water. If you aren’t staying in Valle Gran Rey, but coming with the large passenger ferry from San Sebastian de la Gomera or from Playa Santiago, you have nothing to worry about: The Speedy Adventure waits for the midday ferry to arrive before departing. Your queries will be sent directly to Speedy Adventure.